Can you guess what’s underneath that amazing, thick veil of chocolate? Fudgy bars made with rich-tasting almond butter plus a luscious layer of caramel. Is your stomach growling yet?? Mine sure is. These sweet and decadent Millionaire’s DIY Protein Bars don’t taste healthy at all, they taste like candy bars full of sugar. They actually taste like sin. Pure sin. These decadent Millionaire’s DIY Protein Bars are chocolatey, caramelly, sweet, and rich. Every bite will make you feel like a million bucks. This is THE perfect treat to have on hand for snacks, dessert, or even a breakfast on the go — it’s nutritionally balanced (with fiber, protein and zero refined sugar) so you will stay fuller for longer, unlike typical storebought candy bars. What’s not to love?? In an electric stand mixer bowl tted with a beater attachment, add all of the ingredients. Mix on low speed until everything is fully incorporated. Scrape down the sides of the bowl. Mix on medium speed for one last mix. Mixture should be thick and fudgy, like cookie dough. Scoop the mixture into the brownie pan and flatten it out. In a small bowl, stir together the caramel sauce, protein powder and salt. Mixture should be thick and slightly sticky. Spoon the mixture over the protein bar base and spread to the edges of the pan. Place in the freezer uncovered for 1 hour. Lift the mixture out of the pan. Slice into 12 bars. 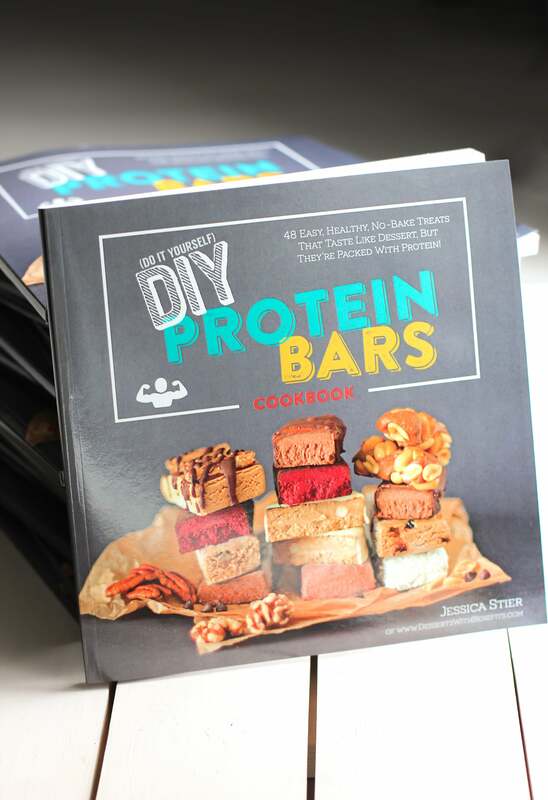 Place a silicone baking mat on top of a jelly roll pan and line the protein bars on top. With a large spoon, ladle the melted chocolate over the protein bars. Try to encase the entire bar with chocolate. Feel free to top the bars with a sprinkle of aked sea salt for decoration! Mmmmm you should seriously just market and sell this stuff. So good. What a great idea to make marcona almond butter! I can only imagine how divine it tastes – I’ll have to remedy that right away, and these millionaire’s bars seem like the perfect way to do it! These look delicious! And the pictures are gorgeous. Can’t wait to trey them! These look just like the Medifast Caramel Nut, bars except for the fact that yours look 10x better and are probably healthier. Im so glad your millionaire bars don’t hve a million chemical ingredients or sugars ending in “ose.” The only “ose ” word in your vocabulary is delici”ose”. Hi! I see that a lot of your recipes call for protein powder.I would really like to make them, but I don’t buy protein powder.So what would be a good substitute that I could use? Oat flour is full of gluten..? No, certified gluten free oat flour contains no gluten. See the link in the recipe to see the GF oat flour I use. Regular oats and oat flour might because oats are commonly grown adjacent to wheat fields, but not all. Wonderful recipe! Keep it up. I just tried making these because they look so good. The problem I had was that the dough never got thick at all. I am using whey protein powder instead of rice protein powder, otherwise everything is pretty much the same. What am I doing wrong, I wonder? 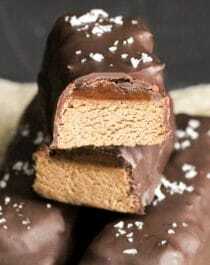 Unfortunately, I have had ZERO luck in making whey protein bar recipes. They never set properly and the mixture turns all gooey and sticky. I do have high-protein recipes with whey protein powder in them, but they’re not technically “protein bars” — they’re more like energy bars. My favorites are the Peanut Butter & Chocolate Shortbread Bars and the Peanut Butter & Jelly Shortbread Bars! These do look amazing. I think these would be a great 3pm snack to keep me going. Jessica, you inspire me. You and your recipes are completely awesome! Can you sub in other plant based protein powders for the rice? I only have vega which is mainly pea protein.